Most recently, I am brokenhearted to share that a close friend, Karisse Schilling, passed away this week from metastasized skin cancer, which had returned. Having overcome breast, brain and skin cancer, the amazing Karisse beat all the odds–so we thought. Three weeks ago, she was hospitalized and discovered that her cancer had come back full force. 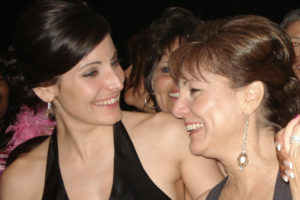 One day before her treatment plan was to begin, she was intubated and passed away just 48 hours later. I am still shocked and saddened beyond words. Was her cancer caused by environmental factors? Could cosmetics and personal products be linked to her disease? It’s literally impossible to say simply due to the fact that all humans in the modern world are exposed to hundreds of chemicals each day, both in and outside of the home. From exhaust fumes to lawn fertilizers to phthalates in toys and furniture to the bleach under the kitchen sink, we are quite literally surrounded by chemicals. Many would argue that chemicals are essential, and I agree! Chemicals themselves are not bad, and we rely on them as an necessary part of everyday life. The concern is that there are toxic chemicals and non-toxic chemicals, and we should not be exposed to the toxic ones. . . yet we are. The most important consideration, and purpose for this film, is answering this question: Are the chemicals found in our daily personal care products healthy or hazardous? Why is there lead in lipstick? 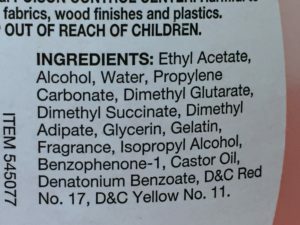 Why are phthalates banned for children’s toys but still found in makeup that their moms use? Why are the anti-micorbial perservatives, parabens, found in human breast tissue of breast cancer patients? Why do baby boys exposed to high levels of phthalates have shorter ano-genital distances and other developmental issues? Why do salon workers who are exposed to Brazilian Blowouts acquire irreversible respiratory issues from ingesting the formaldehyde fumes released by the product? If we know certain chemicals are hazardous to children and/or animals in lab testing, why are we using them in thousands of products we apply to our bodies every day? I am thrilled that you would join me on this journey as I aim to find out just what is hiding inside those beautiful bottles of perfume, lash-o-luscious tubes of mascara and sudsing soaps. The goal of this film is not to blame or sling mud at a specific company or even the industry as a whole. It is also not to purport that all cosmetics and personal products are going to kill you if you use them. Rather, the goal is to learn what the ingredients in the cosmetics may be doing to our bodies, based on the known and existing research of these chemicals of concern, and how we can help foster a healthier change in our products and hygiene routines. I urge viewers to learn what ingredients are in their products and then decide if they are comfortable continuing to put lead, selenium, formaldehyde and phthalates on their bodies. As consumers, we have a choice. It’s time to peel back the syllable-laden labels of our products and find out what’s inside.